Apple trees are typically propagated by grafting because seeds do not produce true-to-type varieties. The top part of the graft is the variety of apple that will produce the fruit and is called the scion. The bottom part is called the rootstock and forms the roots. The choice in rootstock is determined by the special characteristics it offers. Some grafts are done to produce dwarf forms of apple trees; other times it is to take advantage of creating disease-resistant trees. Make a long sloping cut about 2 inches long 6 inches above the soil line at the top of the rooted rootstock. Use a very sharp knife to minimize the damage to the rootstock and scion. Slice a 1/2-inch vertical cut down the middle of the rootstock stem. This is from the top of the slope to the bottom. Create a matching 2-inch cut on the 4 to 6 inch scion that matches the sloping cut on the rootstock. Make sure that your apple twig has 1 to 2 buds on it. Slice a 1/2-inch vertical cut down the middle of the slope at the scion’s base so that it matches the cut on the rootstock. Force the rootstock and scion together by sliding them together and interlocking the cuts. Line up the cambium layers, which is the green area beneath the bark. Wrap the graft together with waxed string to provide support and hold the pieces together. Cover the joining bud with grafting wax to preserve the moisture inside the tree. If the graft dries out, both rootstock and scion will die. The graft will be completely united in 1 to 2 months if done properly. It is essential to match the cambium layers. This layer is the actively growing green tissue that transports the tree sap throughout the tree. Once the cambium layer is united, the apple tree will grow as one unit. 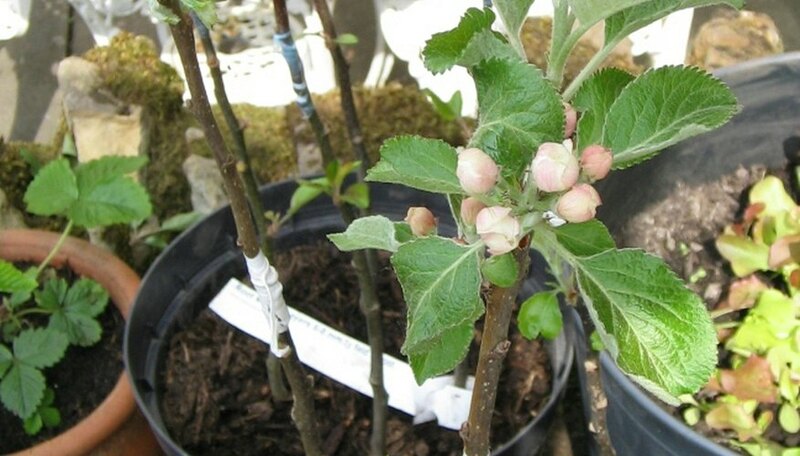 Choose a rootstock that is compatible with the apple variety that you want to propagate. This rootstock can be grown from seeds. Perform your grafting when the air is still, the humidity is high and the temperature is cool. This is to prevent your rootstock and scion cuts from drying out and killing the cambium layer. Use a very sharp knife to make your grafting cuts. A dull knife will crush and damage the cambium layer. This could cause the graft not to heal completely and open a window to tree diseases.